What are the side effects of treatment for cancer of the pancreas? How do patients and families adjust to cancer of the pancreas? What resources are available to cancer patients and families? Cancer is a group of diseases. More than 100 different types of cancer are known, and several types of cancer can develop in the pancreas. They all have one thing in common: abnormal cells grow and destroy body tissue. Healthy cells that make up the body's tissues grow, divide, and replace themselves in an orderly way. This process keeps the body in good repair. Sometimes, however, some cells lose the ability to control their growth. They grow too rapidly and without any order. Too much tissue is made, and tumors are formed. Tumors can be benign or malignant. Malignant tumors are cancer. They can invade and destroy nearby healthy tissues and organs. Cancer cells also can break away from the tumor and spread to other parts of the body. The spread of cancer is called metastasis. 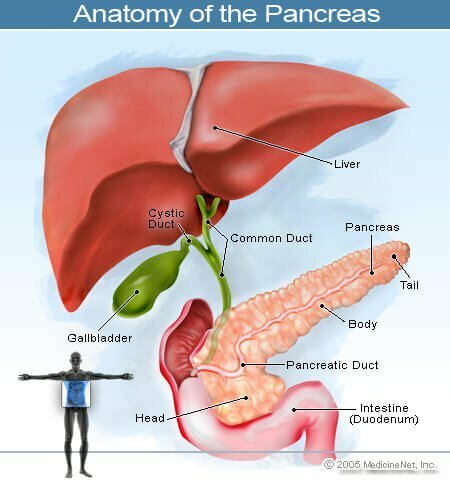 Cancer that starts in the pancreas is called pancreatic cancer. When pancreatic cancer spreads, it usually travels through the lymphatic system. The lymphatic system includes a network of thin tubes that branch, like blood vessels, into tissues all over the body. Cancer cells are carried through these vessels by lymph, a colorless, watery fluid that carries cells that fight infection. Along the network of lymphatic vessels are groups of small, bean-shaped organs called lymph nodes. Surgeons often remove lymph nodes near the pancreas to learn whether they contain cancer cells. Cancer cells can also be carried through the bloodstream to the liver, lungs, bone, or other organs. Pancreatic cancer that spreads to other organs is called metastatic pancreatic cancer. While it can seldom be explained why one person gets pancreatic cancer and another doesn't, it is clear that the disease is not contagious. No one can "catch" cancer from another person. Although scientists do not know exactly what causes cancer of the pancreas, they are learning that some things increase a person's chance of getting this disease. Smoking is a major risk factor. Research shows that cigarette smokers develop cancer of the pancreas two to three times more often than nonsmokers. Quitting smoking reduces the risk of pancreatic cancer, lung cancer, and a number of other diseases. A rare type of pancreatic cancer, called islet cell cancer, begins in the cells of the pancreas that produce insulin and other hormones. Islet cells are also called the islets of Langerhans. Islet cell cancer can cause the pancreas to produce too much insulin or hormones. When this happens, the patient may feel weak or dizzy and may have chills, muscle spasms, or diarrhea. These symptoms may be caused by cancer or by other, less serious problems. If an individual is experiencing symptoms, a doctor should be consulted. To diagnose pancreatic cancer, the doctor does a complete physical exam and asks about the patient's personal and family medical history. In addition to checking general signs of health (temperature, pulse, blood pressure, and so on), the doctor usually orders blood, urine, and stool tests. The doctor may also ask for a "barium swallow," or "upper GI series." For this test, the patient drinks a barium solution before x-rays of the upper digestive system are taken. The barium shows an outline of the pancreas on the x-rays. An angiogram, a special x-ray of blood vessels. CT scans, x-rays that give detailed pictures of a cross- section of the pancreas. These pictures are created by a computer. Transabdominal ultrasound to view the pancreas. In this procedure, an instrument that sends out high-frequency sound waves, which cannot be heard, is passed over the abdomen. The sound waves echo off the pancreas. The echoes form a picture on a screen that looks like a television. ERCP (endoscopic retrograde cholangiopancreatogram), is a special x-ray of the common bile duct. For this test, a long, flexible tube (endoscope) is passed down the patient's throat through the stomach and into the small intestine. A dye is injected into the common bile duct, and x-rays are taken. The doctor can also look through the endoscope and take tissue samples. Endoscopic ultrasound is a relatively new procedure that can be used to diagnose pancreatic cancer. For the procedure, an endoscope is passed in the same way as for ERCP; however, on the end of the endoscope is an ultrasound probe which scans the pancreas for cancers. Because the ultrasound probe is closer to the pancreas than with transabdominal ultrasound, it is possible to identify small cancers within the pancreas. The cancers also can be biopsied through the endoscope. A biopsy is the only sure way for the doctor to know whether cancer is present. In a biopsy, the doctor removes some tissue from the pancreas. It is examined under a microscope by a pathologist, who checks for cancer cells. One way to remove tissue is with a long needle that is passed through the skin into the pancreas. This is called a needle biopsy. Doctors use x-rays or ultrasound to guide the placement of the needle. Another type of biopsy is a brush biopsy. This is done during the ERCP. The doctor inserts a very small brush through the endoscope into the bile duct to rub off cells to examine under a microscope. Sometimes an operation called a laparotomy may be needed. During this operation, the doctor can look at organs in the abdomen and can remove tissue. The laparotomy helps the doctor determine the stage, or extent, of the disease. Knowing the stage helps the doctor plan treatment. Tissue samples that are obtained with one kind of biopsy may not give a clear diagnosis, and the biopsy may need to be repeated using a different method. How is cancer of the pancreas treated? Treatment for pancreatic cancer depends on a number of factors. Among these are the type, size, and extent of the tumor as well as the patient's age and general health. A treatment plan is tailored to fit each patient's needs. Cancer of the pancreas is curable only when it is found in its earliest stages, before it has spread. Otherwise, it is very difficult to cure. However, it can be treated, symptoms can be relieved, and the quality of the patient's life can be improved. Pancreatic cancer is treated with surgery, radiation therapy, or chemotherapy. Researchers are also studying biological therapy to see whether it can be helpful in treating this disease. Sometimes several methods are used, and the patient is referred to doctors who specialize in different kinds of cancer treatment. Surgery may be done to remove all or part of the pancreas. Sometimes it is also necessary to remove a portion of the stomach, the duodenum, and other nearby tissues. This operation is called a Whipple procedure. In cases where the cancer in the pancreas cannot be removed, the surgeon may be able to create a bypass around the common bile duct or the duodenum if either is blocked. Radiation therapy (also called radiotherapy) uses high-powered rays to damage cancer cells and stop them from growing. Radiation is usually given 5 days a week for 5 to 6 weeks. This schedule helps to protect normal tissue by spreading out the total dose of radiation. The patient doesn't need to stay in the hospital for radiation therapy. Radiation is also being studied as a way to kill cancer cells that remain in the area after surgery. In addition, radiation therapy can help relieve pain or digestive problems when the common bile duct or duodenum is blocked. Chemotherapy uses drugs to kill cancer cells. The doctor may use just one drug or a combination. Chemotherapy may be given by mouth or by injection into a muscle or vein. The drugs enter the bloodstream and travel through the body. Chemotherapy is usually given in cycles; a treatment period followed by a recovery period, then another treatment period, and so on. The methods used to treat pancreatic cancer are very powerful. It is hard to limit the effects of treatment so that only cancer cells are destroyed. Healthy tissue may also be damaged. That is why treatment often causes unpleasant side effects. Side effects depend on the type of treatment used and on the part of the body being treated. Surgery for cancer of the pancreas is a major operation. While in the hospital, the patient will need special medications and may be fed only liquids. During recovery from surgery, the patient's diet and weight will be checked carefully. During radiation therapy, the patient may become very tired as the treatment continues. Resting as much as possible is important. Skin reactions (redness or dryness) in the treated area are also common. Good skin care is important at this time, but the patient should not use any lotions or creams on the skin without checking with the doctor. Radiation therapy to the upper abdomen can cause nausea and vomiting. Usually, dietary changes or medications can ease these problems. The side effects of chemotherapy depend on the drugs that are given. In addition, each person reacts differently. Chemotherapy affects rapidly growing cells, such as blood-forming cells, those that line the digestive tract, and those in the skin and hair. As a result, patients can have side effects such as a lowered resistance to infection, less energy, loss of appetite, nausea, vomiting, or mouth sores. Patients may also lose their hair. Weight loss can be a serious problem for patients being treated for cancer of the pancreas. Researchers are learning that well- nourished patients usually feel better and may be better able to withstand the side effects of their treatment. Therefore, nutrition is an important part of the treatment plan, and doctors may have a number of suggestions to help their patients get enough calories and protein. In many cases, patients feel better if they take food and beverages in very small amounts. Many patients find that eating several small meals and snacks throughout the day is easier than having three large meals. In addition, treatment for cancer of the pancreas may interfere with production of insulin and pancreatic juices. The patient must take medicines to replace these; otherwise the level of blood sugar may be wrong and digestion may be affected. Even so, taking these medicines can often upset digestion. Careful planning and checkups are important to help the patient avoid weight loss and the weakness and lack of energy caused by poor nutrition. Patients and family members are often afraid that cancer will cause pain. Cancer patients do not always have pain, but if it does occur, there are many ways to relieve or reduce it. It is important for the patient to let the doctor know about pain, because uncontrolled pain can cause loss of sleep and poor appetite. These problems can make it difficult for the patient to respond to treatment. The side effects that patients have during cancer therapy vary for each person. They may even be different from one treatment to the next. Attempts are made to plan treatment to keep problems to a minimum. Fortunately, most side effects are temporary. Doctors, nurses, and dietitians can explain the side effects of cancer treatment and can suggest ways to deal with them. Helpful information about cancer treatment and coping with side effects is given in the National Cancer Institute publications Radiation Therapy and You, Chemotherapy and You, and Eating Hints. The diagnosis of pancreatic cancer can change the lives of cancer patients and the people who care about them. These changes in daily life can be difficult to handle. It is natural for patients and their families and friends to have many different and sometimes confusion emotions. At times, patients and their loved ones may feel frightened, angry, or depressed. These are normal reactions that people have when dealing with a serious health problem. Others in the same situation have found that they cope with their emotions better if they can talk openly about their illness and their feelings with those who care about them. Sharing feelings with loved ones can help everyone feel more at ease, opening the way for others to show their concern and offer their support. Many patients find that it helps to talk with others who are facing problems like theirs. They can meet other cancer patients through self-help and support groups such as those described in the next section. Worries about tests, treatments, hospital stays, and medical bills are common. Talking with doctors, nurses, or other members of the health care team may help to calm fears and ease confusion. Patients can take an active part in decisions about their medical care by asking questions about pancreatic cancer and their treatment choices. Patients, family, or friends often find it helpful to write down questions to ask the doctor as they think of them. Taking notes during visits to the doctor helps them remember what was said. Patients should ask the doctor to explain anything that is not clear. Patients have many important questions, and the doctor is the best person to answer them. Most people ask about the extent of their cancer, how it can be treated, and how successful the treatment is likely to be. Patients are naturally concerned about their future and may try to use statistics they have heard to figure out what the future holds. It is important to remember, however, that statistics are averages. They are based on the experiences of large numbers of patients, and no two cancer patients are alike. The doctor who takes care of the patient and knows his or her case is the best person to discuss the patient's prognosis. The doctor can give advice about treatment, working, or limiting activities. Patients also may wish to discuss their concerns about the future, family relationships, and finances. If it is hard to talk to the doctor about feelings and other very personal matters, it may be helpful to speak with a nurse, social worker, counselor, or a member of the clergy. Learning to live with the changes brought about by cancer is easier for patients and those who care about them when they have helpful information and support services. Often, the social service office at the hospital or clinic can suggest local and national agencies that will help with emotional support, financial aid, transportation, or home care. The American Cancer Society (ACS), for example, is a nonprofit organization that has many services for patients and their families. Local ACS offices are listed in the white pages of the telephone book. Information about other programs and services for cancer patients and their families is available through the Cancer Information Service at 1-800-4-CANCER. What does the future hold for patients with cancer of the pancreas? Scientists at hospitals and medical centers all across the country are studying pancreatic cancer. They are trying to learn what causes this disease and how to prevent it. They are also looking for better ways to diagnose and treat it. The NCI is supporting may studies of new treatments for pancreatic cancer. Researchers are exploring new drugs and drug combinations, new forms of radiation therapy, biological therapy, and combinations of these treatments. Researchers are also looking at new ways to give radiation. For example, they are studying giving radiation therapy two or more times a day, or during surgery (intraoperative radiation), or with drugs that help protect normal tissue so that higher doses can be given. Biological therapy is a new type of cancer treatment that uses natural and laboratory-produced substances to stimulate or restore the body's immune system so it can fight disease more effectively. This kind of treatment is being studied in patients with advanced or recurring cancer of the pancreas. When laboratory research shows that a new treatment method has promise, it is used to treat cancer patients in clinical trials. These trials are designed to answer scientific questions and to find out whether a new treatment is both safe and effective. Patients who take part in clinical trials make an important contribution to medical science and may have the first chance to benefit from improved treatment methods. A person with cancer of the pancreas who is interested in taking part in a trial should discuss this option with his or her doctor. One way to learn about clinical trials is through PDQ, a computerized resource of cancer treatment information. Developed by NCI, PDQ contains an up-to-date list of trials all over the country. Doctors can obtain an access code and use a personal computer to get PDQ information, or they can use the services of a medical library. Also, the Cancer Information Service, at 1-800-4-CANCER, can provide PDQ information to doctors, patients, and the public. General information about cancer is widely available. Some helpful resources and publications are listed below. Others may be available at a local library or from support groups in your community. The Cancer Information Service, a program of the National Cancer Institute, is a nationwide telephone service for cancer patients, their families and friends, the public, and health professionals. The staff can answer questions in English and Spanish and can send booklets about cancer. They also know about local resources and services. One toll-free number, 1-800-4-CANCER (1-800-422-6237), connects callers with the office that serves their area. The American Cancer Society is a voluntary organization with a national office (at the above address) and local units all over the country. It supports research, conducts educational programs, and offers many services to patients and their families. To obtain free booklets about services and activities in local areas, call the Society's toll-free number, 1-800-ACS-2345 (1-800-227-2345), or the number listed under "American Cancer Society" in the white pages of the telephone book.